Kids love butternut squash because it is bright orange, creamy, and sweet. Butternut squash is a winter squash that needs to ripen completely and has a hard skin. It is rich in beta carotene which is good for skin, lungs, heart, and eyes. 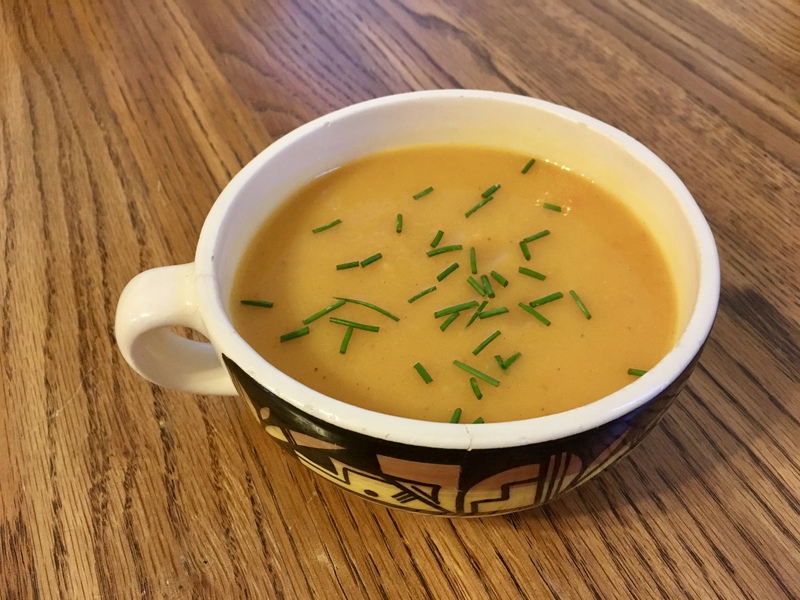 Kids can steam 2 cups of pealed and rough chopped organic butternut squash, 1 medium chopped organic sweet potato, 1 large chopped organic carrot, ¼ cup chopped organic onion, and 1 small organic deseeded chili. Pour half of the steamed veggies in the blender with 1 cup of steam water and blend until smooth. Pour the mixture into a large bowl and repeat with the other half of steamed veggies and another cup of steam water. Kids can also use 2 cups of their homemade veggie broth. Add 1 tbsp organic extra virgin olive oil, 1 tsp organic maple syrup, ½ tsp sea salt, and ⅛ tsp cinnamon and mix well. Serve with fresh chopped chives from the garden. Kids can freeze this soup for up to 6 months and defrost it overnight in the refrigerator.